Japanese whalers went back to their centuries-old tradition of hunting whales on Thursday, carving a 30ft long whale for school children. Workers in a coastal town can be seen carving up one of the animals as a crowd of students stood round, with free samples of its fried meat handed out later. Children from two local elementary schools, on a field trip, watched as workers from a whaling company butchered the whale. The annual event took place in the town of Wada, south of Tokyo, a week into Japan's first coastal whaling season since a global court halted the country's better known Antarctic whaling in March. Though environmentalists condemn whaling, Japan maintains that it's an important part of its food heritage. Ishii said he regrets having killed dolphins and is currently conducting eco-tours in Taiji, offering tourists the sights and sounds of dolphins swimming in the wild. The judgment by the International Court of Justice in The Hague is binding, final and ineligible for appeal, forcing Japan to drastically change the whaling program it long claimed was for “scientific research.”THE, HAGUE – The U.N.’s top court on Monday ordered Japan to end its annual Antarctic whale hunt, saying in a landmark ruling that the program was a commercial activity disguised as science. While the decision does not apply to whaling in the Pacific Ocean, it is likely to deal a severe blow to the entire whaling industry, which has come under strong criticism from Western countries. Koji Tsuruoka, the official who represented the Japanese government in the case, told reporters that Tokyo will comply with the judgment as a country that respects the rule of law, but expressed deep disappointment with the order to “revoke” any permit or license for whaling in the specified area. 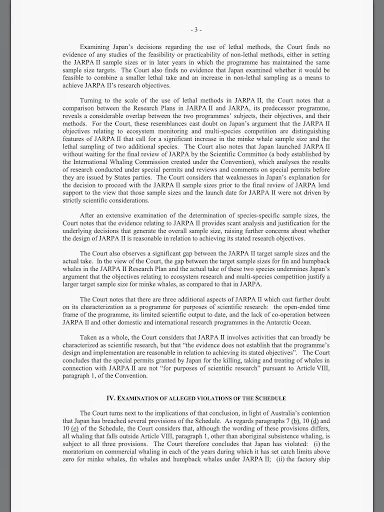 “Japan shall revoke any existent authorization, permit or license granted in relation to JARPA II (research program) and refrain from granting any further permits in pursuance to the program,” ICJ Presiding Judge Peter Tomka said. “The evidence does not establish that the program’s design and implementation are reasonable in relation to its stated (scientific) objectives,” Tomka said. Matthew Collis, marine campaigns manager at the International Fund for Animal Welfare, said in Sydney that the decision is a “major victory for whaling conservation in international law” and called on Tokyo to abide by the court’s ruling. Jeff Hansen, managing director of Sea Shepherd Australia, said the ruling was the correct one. “Sea Shepherd has been upholding the Australian Federal Court ruling and the International Court has just acknowledged what Japan is doing is illegal. It’s a real testament to Sea Shepherd and all its supporters and Capt. Paul Watson, all these years and his efforts,” Hansen said, adding that he hopes Japan will respect the decision. “Our hope is that Japan can be a nation that loves whales and sees the huge benefit from eco-tourism that Australia does, which was also a nation that used to hunt whales,” he said. While Norway and Iceland run commercial whaling programs in spite of a 1986 International Whaling Commission moratorium, Japan insists that its program is scientific, while at the same time admitting the resulting meat ends up on plates back home. 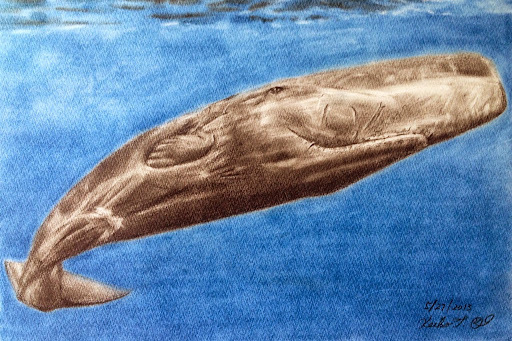 Japan, which embarked on what it called “scientific” whaling in the Antarctic Ocean in 1987, insisted the program was consistent with Article 8 of the 1946 International Convention for the Regulation of Whaling, which permits research whaling, and said the selling of the resulting meat is also permitted under the article because it requires any whales taken to be processed as far as practicable. 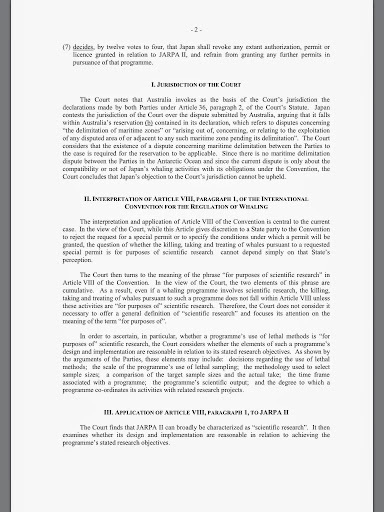 The court also noted that the scientific aspect of Japan’s program is being undermined by its limited scientific output to date and the open-ended time frame of the program, pointing that there has not been enough Japanese cooperation with other domestic and international researchers over species in the Antarctic Ocean. Since 1987, Japan has taken an average of 400 minke whales each year from the Antarctic Ocean, according to data released by the Fisheries Agency. In 2005 Japan set an annual target of 935 minke whales and its fleet caught a total of 853 in 2005 and 679 in 2008. However, its annual catch plunged to 103 in 2012, with anti-whaling activities cited by officials as the main cause. After the moratorium on commercial whaling by the International Whaling Commission took force in 1986, Japan continued to hunt the mammals under quotas set by the government, saying collecting scientific data was necessary for the sustainable use of whale resources. Japan’s rationale was that “scientific whaling” could be used to provide evidence to lift the moratorium and thus resume commercial whaling. This was feasible because a legal loophole in the moratorium permits hunting to collect scientific data, and Tokyo was accused of exploiting it. Canberra had said that Japan had, since 1988, slaughtered more than 10,000 whales under scientific whaling, allegedly putting it in breach of international conventions and its obligation to preserve marine mammals and their environment. But Japanese officials said beforehand that Tokyo would accept the verdict of the ICJ, which was set up after World War II to rule on disputes between countries.Japan in April last year announced its whaling haul from the Southern Ocean was at a record low because of “unforgivable sabotage” by activists from the militant environmental group Sea Shepherd. Prime Minister John Key has hailed the halt to Japanese whaling as a great decision. "And given that we would make the case they've largely been commercially whaling that may well not be commercial for them so hopefully they would abandon that. "Key said the Japanese could still apply to the ICJ or to the International Whaling Commission to return to the Southern Ocean with a true scientific whaling programme but that would likely see a major reduction in their allowable catch. 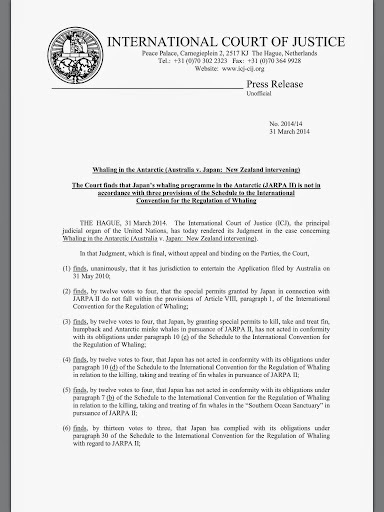 Judges at the International Court of Justice, the highest UN court, today rejected Japan's long-held argument that the catch was for scientific purposes and not primarily for human consumption.Prime Minister John Key has called the UN ruling against Japanese whaling "a great decision" and said he hoped it would see an end to whaling in the Southern Ocean. It was unlikely they would pull out of the IWC as they had already said they would observe the decision and had historically observed the rule of law, he said. "So I think for New Zealanders hopefully we've seen the last of Japanese whaling vessels in the great Southern Ocean." Tokyo said it was disappointed but would abide by the decision, while activists said they hoped it would bring closer a complete end to whaling. The court sided with plaintiff Australia, which was supported by New Zealand, in finding that the scientific output of the whaling programme did not justify the number of whales killed. The practice was deeply offensive to many New Zealanders, Foreign Affairs Minister Murray McCully said this morning. Activist Pete Bethune, who in 2010 was arrested and indicted in Japan after he boarded a Japanese whaling vessel in the southern ocean, slept outside The Hague overnight to make sure he was in the court to see the ruling handed down. "I am over the moon," he said today. "I believe justice has been served and I feel in some way vindicated with my activities in 2010. It's been amazing, a very emotional day." The tribunal said no further licences should be issued for scientific whaling, where animals are first examined for research purposes before the meat was sold to consumers. "In light of the fact the JARPA II (research programme) has been going on since 2005, and has involved the killing of about 3600 minke whales, the scientific output to date appears limited," presiding Judge Peter Tomka of Slovakia said. Japan was "deeply disappointed" by the ruling, but it would comply, said Koji Tsuruoka, the country's chief lawyer before the court. He said the Japanese Government would need to study the ruling before taking any further action. Judges agreed with Australia that the Japanese research - two peer-reviewed papers since 2005, based on results obtained from just nine killed whales - was not proportionate to the number of animals killed. WHALING PROGRAMME 'HARPOONED'The judgment is an embarrassment to Japan, but Tokyo could continue whaling if it devised a new, more persuasive programme of scientific that required "lethal catch" of whales, or if it withdrew from the whaling moratorium or the 1946 International Convention for the Regulation of Whaling. "The ICJ decision sinks a giant harpoon into the legality of Japan's whaling programme: JARPA II," he said. "New Zealand has consistently opposed Japan's so-called 'scientific' whaling, which is a practice that is deeply offensive to many New Zealanders." McCully said he hoped Japan would "respect the Court's decision". He said he sent a text to Australian speaker of the house Bronwyn Bishop last night to congratulate her on the decision. McCully said New Zealand could also take "significant credit" as well. "The legal case that New Zealand spelt out as intervenor in the court is essentially the logic the court outlined in its judgement last night, so I think the lawyers who served the New Zealand Government's interest here have absolutely picked the right lines to run with for the court," he said. "They've effectively had their position confirmed." 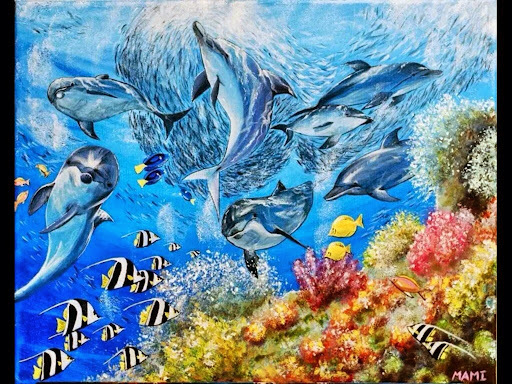 But McCully stopped short of saying any thanks for the decision could go to Sea Shepherd. "What I've said before is a programme that is carried out today, largely for reasons of pride on Japan's part, rather than because there's any use for the whale meat or any useful scientific outcomes," he said. "One of the problems has been that the protest activity down there has rather made Japan dig its heels in. So while I'm sure that some of the Sea Shepherd people will claim credit for it, in fact my own perspective is Japan needs a bit of space here to work its way out of what is a practice that's got no future." Labour's foreign affairs spokesman David Shearer said the ruling was a victory for both New Zealand and Australia. "The court has confirmed what New Zealand has always claimed - that Japan's continued killing of whales under JARPA II, which is nothing more than slaughter under the highly dubious guise of science, is false," he said. "Like New Zealand, Japan has always placed great importance on the international legal order and the rule of law. 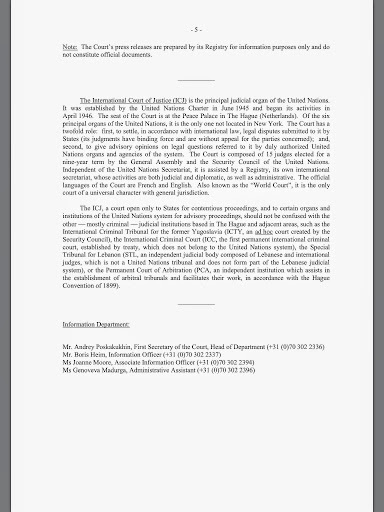 Japan's early statements that it will abide by the ICJ's ruling are welcome. "Diplomatic efforts are now needed to ensure that new loopholes are not found to continue whaling operations." Shearer said the decision was "fantastic news" for those who had campaigned for the protection of whales. Whaling was once widespread around the world, but Japan is now one of only three countries, alongside Iceland and Norway, that continue the practice. The meat is popular with some Japanese consumers who consider it a delicacy. Norway set a quota of 1286 minke whales in the north Atlantic in last year's summer hunt, saying stocks were plentiful in the region. Fishermen rarely catch the full quota, partly because demand has sunk in recent years. In a historic victory for whales that has been years in the making, the United Nations’ highest court ruled on Monday that Japan’s whaling in Antarctica is illegal under international law and has to stop immediately. The ruling, which was handed down by the International Court of Justice (ICJ) in The Hague, will end Japan’s scientific whaling program, which has targeted thousands of fin, minke and humpback whales in the Southern Ocean Whale Sanctuary since it began. Despite a worldwide moratorium on commercial whaling that was put in place in 1986, Japan has continued with annual whale hunts that it claims are being conducted to collect scientific data. Conservationists, however, have long argued that Japan has been abusing a loophole in the moratorium that allows for scientific research whaling. 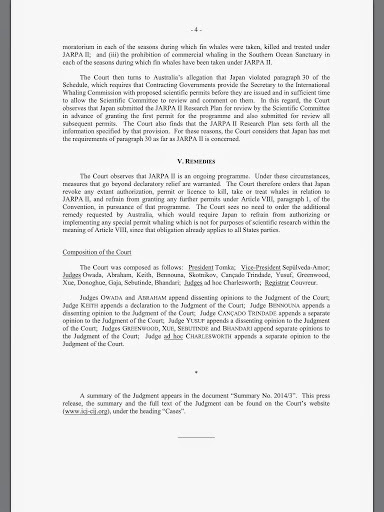 In 2010, Australia challenged Japan with New Zealand’s support in the ICJ over Japan’s JARPA II research program, arguing it was just a cover for commercial whaling. 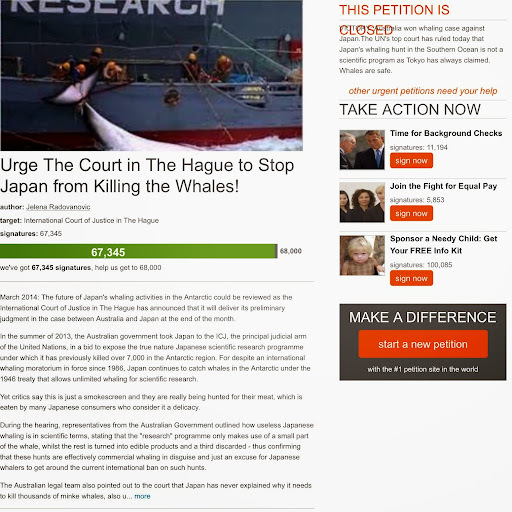 The risk was big because there would be no appeal for whichever side lost, and if the court sided with Japan it would have been a huge blow to global campaigns against whaling. Fortunately for whales, the court agreed with Australia, ruling that Japan was in breach of its international obligations under the International Convention for the Regulation of Whaling by hunting and killing whales in the Southern Ocean. Among other conclusions, the court found that Japan had no justification for the quota of whales it was setting annually, had failed to consider non-lethal alternatives and that the research program fell seriously short on science. The court ordered Japan to revoke existing permits or licenses related to its scientific whaling program and refrain from granting any in the future. Although the ruling won’t stop whaling entirely, it will make the Southern Ocean the safe haven for whales it was intended to be and is being applauded by whale advocates and conservationists around the world. Whether or not whaling itself is environmentally sustainable, many now argue that it’s not an economically viable option for Japan anymore and that it’s only still around because it’s being largely subsidized by the government. Even if the court had sided with Japan, a drastically declining demand for whale meat poses another huge problem for the industry and has raised hope that decreasing appetites for whale meat will help kill the international market. According to the AP, the amount of whale meat stockpiled for lack of demand has nearly doubled over 10 years, with about 4,600 tons stockpiled at the end of 2012. While Japanese officials say they will abide by the ruling, Sea Shepherd stated that it will have ships ready to return to the Southern Ocean to defend whales next winter just in case. Care2 member Jelena Radovanovic helped influence the outcome of the ruling by simply starting a petition and putting pressure on the court to take action. If there’s an issue you care about, you can make a difference by starting your own petition.